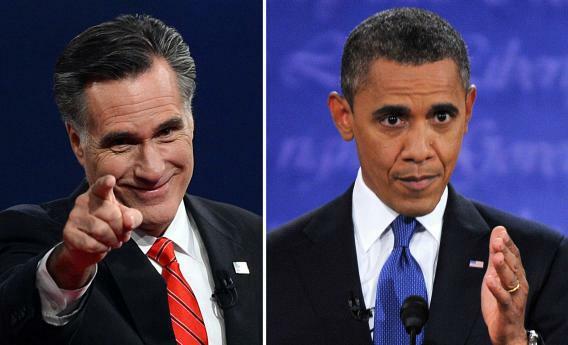 Obama and Romney debate: wonkish nonsense wins. When we imagine the vapidity that is American presidential debate, we think of platitudinous generalization: “I love great schools,” says one man. “I love great schools harder,” says another. We imagine talk of patriotism, “the free enterprise system,” “the American people,” “the troops.” Large groups of people with the possessive attached: Our children. Our seniors. We do not, then, imagine, last night’s endless enumerations: the percentages, the integers, the arithmetic back-and-forth. Granted, none of the numbers will add up, because it is not possible to cut taxes for the middle class, balance the budget, and build the perfect society at the same time. But my intention is not to judge this or any debate by an adherence to known truths. I’ll leave that to others. What Romney and Obama brought last night was a glorious rhetoric of specificity, though specific to a world not ours. To paraphrase Ross Douthat, it was the most wonkish debate in recent memory, and it was all nonsense. Obama dreams up some tax deductions for moving a plant overseas. Romney conjures an entire made-up tax plan, seemingly on the spot. Obama imagines a number by which Romney’s made-up tax plan will increase the debt, and counters with a precise number of dollars that he might have, in another world, cut from the budget. Romney makes up a number of dollars by which the average family’s health care costs have gone up. This is a certain kind of mastery over non-facts, and I find it genuinely impressive. When forced into a misleading statement lesser intelligences will gravitate toward the general, but Obama and Romney have command of the fake particulars, and bat them around with considerable facility. Fake fact-giving is harder than truth-telling, and rather more fun to watch. I like the two worlds we learned about last night; I would prefer to live in one of them. This morning, we find expressions of great disappointment in last night’s performance. Self-appointed protectors of civic tradition point out that we know no more of Romney’s tax plan, that Obama has misled people as to his supposed budgetary restraint. And yet I would ask why, should you be in search of hard facts about the future of this nation, would you wait for them to emerge from the candidates’ mouths? Even in the best of times, with two men of great integrity, this would seem a truly inefficient way to conduct an investigation into objective truths. There are deeply detailed policy papers available for anyone interested in tax policy as it exists in this world. For the rest of us, there are debates, which is to say empty promises made well.